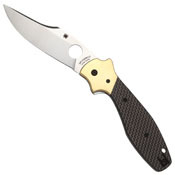 Designed by renowned custom knifemaker Ed Schempp, Spyderco’s Schempp Bowie honors the iconic American Bowie Knife by expressing it as a modern, high-performance folder. Its distinctive blade faithfully retains the broad profile, long belly, and concave clip point of the classic Bowie pattern, but renders them in premium CPM-S30V powdered metallurgy stainless steel. 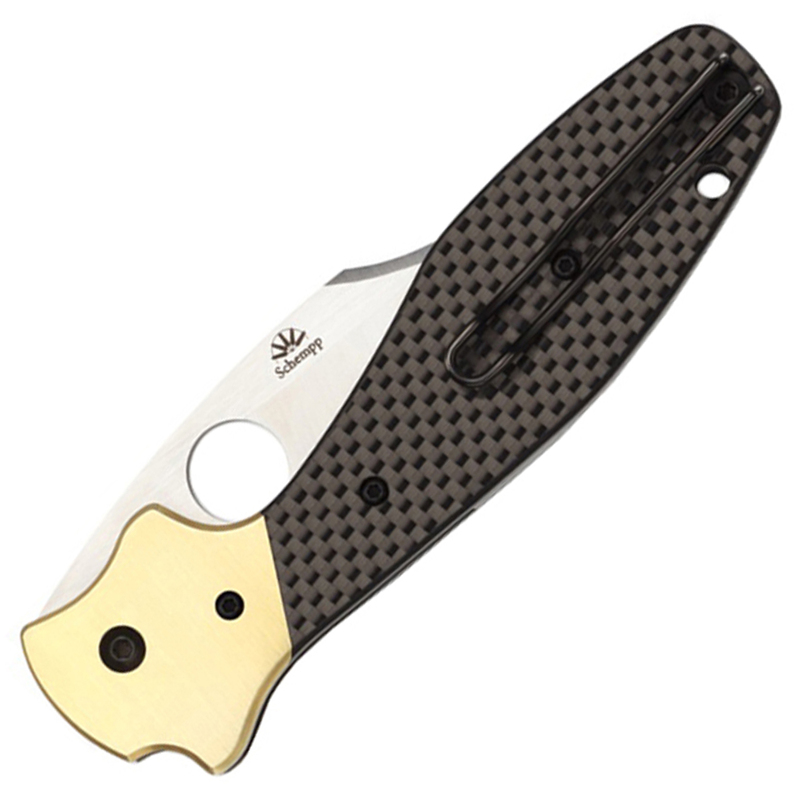 The high flat grind and full-thickness spine offer an exceptional synthesis of strength and low-friction edge geometry, while Spyderco’s Trademark Round Hole ensures swift, positive, one-handed opening with either hand. The Schempp Bowie’s handle blends tradition and state-of-the-art materials by combining skeletonized full stainless steel liners, carbon fiber/G-10 laminate scales, a solid steel backspacer, and classic brass bolsters. The bolsters include a subtle but functional integral double guard and are mated to the scales with a meticulously machined dovetail joint. The classic “coffin-shaped” handle has a slightly “dropped” angle to allow a natural wrist angle during use. This subtle detail shortens the blade’s opening arc, increases cutting power, reduces fatigue, and instinctively orients the point with the axis of the forearm. A stout LinerLock mechanism locks the blade securely when in use and a reversible deep-pocket wire clip provides instant access and exceptionally discreet tip-up carry. An amazing fusion of traditional style and state-of-the-art manufacturing and materials, Spyderco’s Schempp Bowie is a fitting tribute to one of America’s most revered cultural symbols.